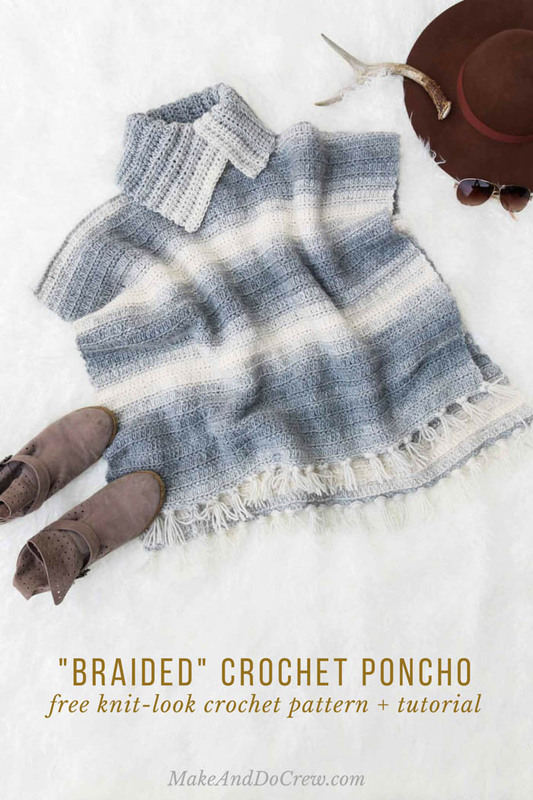 A simple combination of extended half double crochet and slip stitches make for a knit-looking “braided” texture in this free women’s crochet poncho pattern. Get the full free pattern below or purchase the ad-free, printable PDF for $2.75 here. This free women’s crochet poncho pattern is part of a collaboration with my friends at Lion Brand Yarn. This post contains affiliate links. On my way home from visiting Lion Brand in New York a few weeks ago, I found myself on a plane, sleep deprived with one ball of Scarfie yarn and (gasp!) no internet access. Without any way to look up stitch tutorials or even peruse Pinterest for texture inspiration, I was left with only a hook and my imagination. Three and a half hours later I touched down in Denver with a new (or at least new to me) combination of crochet stitches that looks quite knit or even braided. 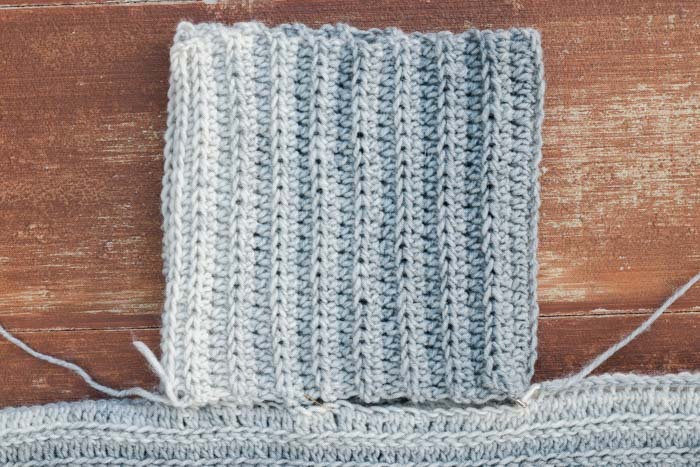 I’ve been loving crochet projects that look knit lately (see a bunch of my faves here), so I had been thinking about how a slip stitch, when worked a certain way, looks a bit like a knit stitch. 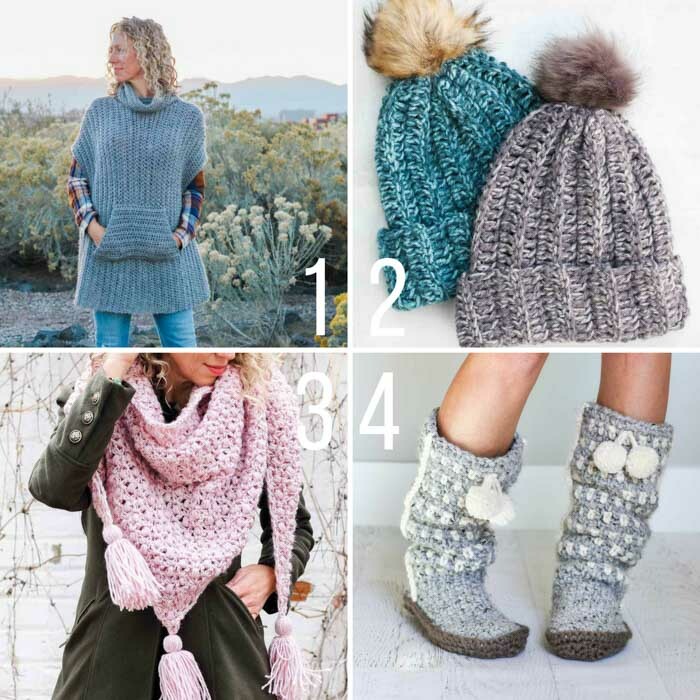 Throw in some extended half double crochet stitches so the thing doesn’t take f-o-r-e-v-e-r and you’ve got yourself a really pretty stitch pattern that’s super easy to execute. 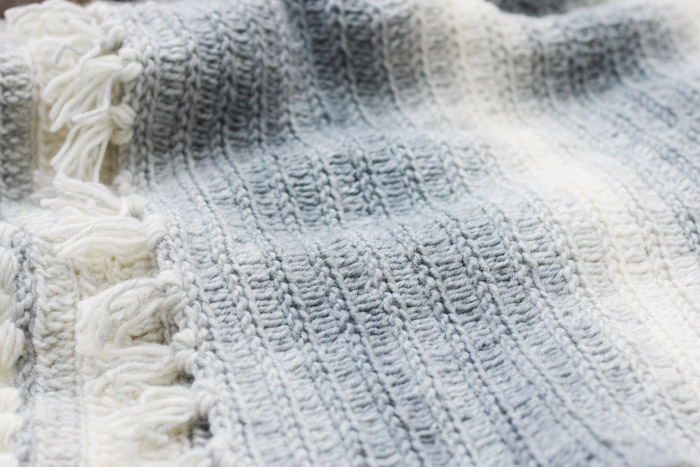 UPDATE: You can find the step-by-step video tutorial for this stitch here. Like many of my projects, this free women’s crochet poncho pattern is constructed from two simple rectangles. 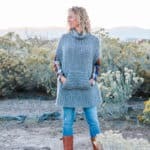 Make a third rectangle for the collar, add a dash of fringe and you’ve got yourself a southwestern-inspired garment that looks like an intentional style decision–and feels like pajamas! The Lion Brand Scarfie yarn used in the sample has been on my list to try for a long time. I love how its slightly roving-looking texture is a category 5 yarn (one heavier than worsted weight) because it makes projects quicker to make without becoming super bulky. And the stripes! Well, the stripes are really cool to watch develop because the color changes are so gradual and gentle. 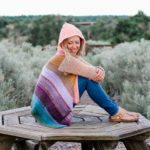 I really love how Scarfie gives this crochet poncho an organic, cozy and bohemian vibe. I feel like I should admit that when I started this project, I had every intention of it becoming a women’s pullover sweater, but after about halfway through my first rectangle, it was clear that the shape I was making was much better suited for a poncho. Ironically, I really love how this sweater-turned-poncho eventually turned out and I hope you do too! Feel like you’re wrapped in a fireside woven blanket sweater when you wear this perfectly simple crochet poncho. 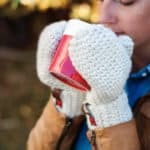 The self-striping yarn does all the color work and a combination of extended half double crochet and slip stitches make for a knit-looking “braided” texture. A ribbed turnover collar completes this unfussy, but intentional look. 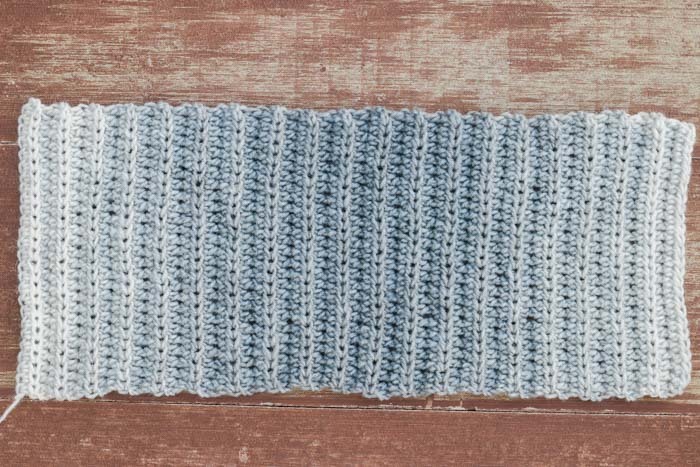 This pattern is made from three basic rectangles and is perfect for a confident beginner. Sizes include S-3x. 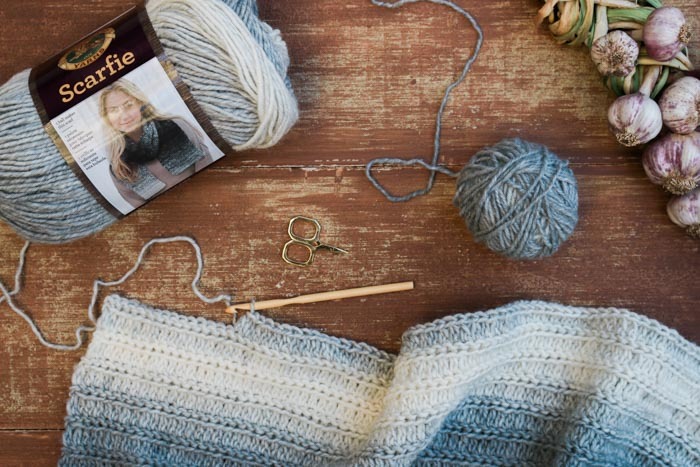 • When using Scarfie yarn, be mindful of how attaching a new skein will influence the self-striping pattern. Consider breaking yarn and reattaching if skeins don’t naturally create desired striping effects. • To adjust the width of the poncho, chain any number of sts + 3 for the foundation ch on both the front and the back pieces. • The ch 3 at the beginning of each row does not count as a stitch. 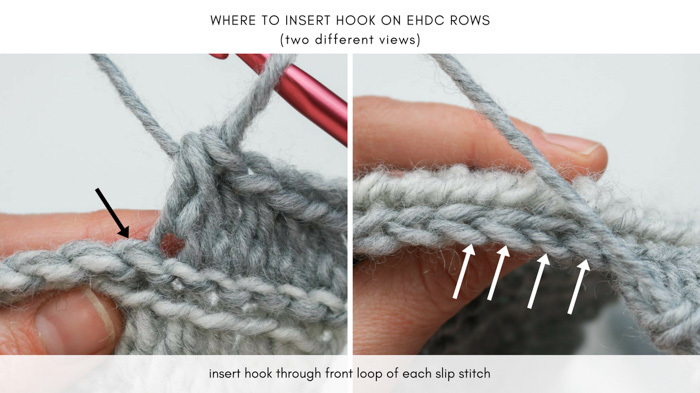 • See photos below for the hook placement in each row. • View the step-by-step video tutorial for the stitch used in this pattern here. Foundation Row: Ch 100 (106, 112, 118, 124). Rows 5-48 (50, 50, 52, 52): Repeat Rows 3 and 4 22 (23, 23, 24, 24) more times, ending with a WS row. There should be a total of 24 (25, 25, 26, 26) rows of ehdc and 24 (25, 25, 26, 26) rows of sl sts. Row 49 (51, 51, 53, 53) (RS): Repeat Row 4 once more. • Front and back are worked identically except for total number of rows. Rows 5-54 (56, 56, 58, 58): Repeat Rows 3 and 4 25 (26, 26, 27, 27) more times, ending with a WS row. There should be a total of 27 (28, 28, 29, 29) rows of ehdc and 27 (28, 28, 29, 29) rows of sl sts. Row 55 (57, 57, 59, 59) (RS): Repeat Row 4 once more. Foundation Row: Ch 28 (all sizes). Fasten off leaving a 24” tail for seaming. IMPORTANT: Keep poncho front facing you as you sl st seam pieces together. Lay front piece on top of back piece, with RS facing out on both pieces. The foundation ch edges should be oriented toward top of poncho. Join yarn in upper right corner (left corner for lefties). Working into one ch st of both pieces so as to keep front and back aligned, sl st through 38 (41, 44, 47, 50) foundation chain sts. Fasten off. Beginning at upper left corner of rectangle (right corner for lefties), count 38 (41, 44, 47, 50) foundation ch sts and PM. Attach yarn in marked st and sl st along pieces in same direction as first seam until end of row. Fold collar as pictured in photo below. Folded collar should measure approximately 18” wide. Pin collar to poncho keeping overlapping collar pieces in front. Using collar tail and tapestry needle, seam collar to neck opening. 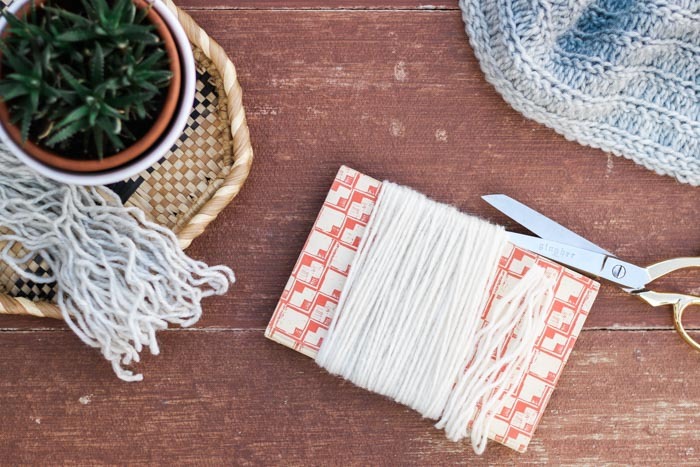 • To quickly cut fringe pieces of all same length, wrap yarn dozens of times around a small book and insert scissors between front and back cover to cut as pictured above pattern. 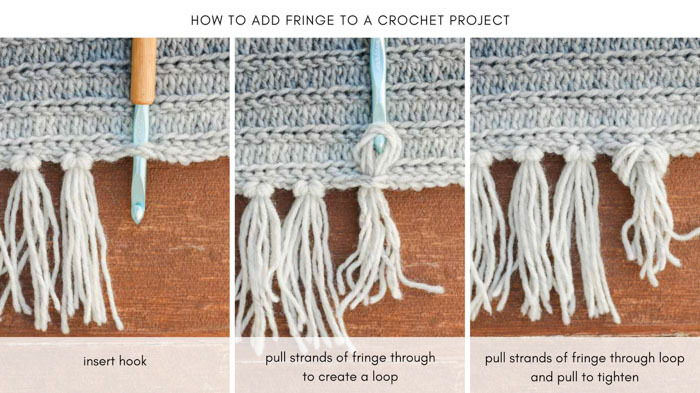 Attach fringe at approximately 1.5” intervals along poncho bottom. Rep on second side. 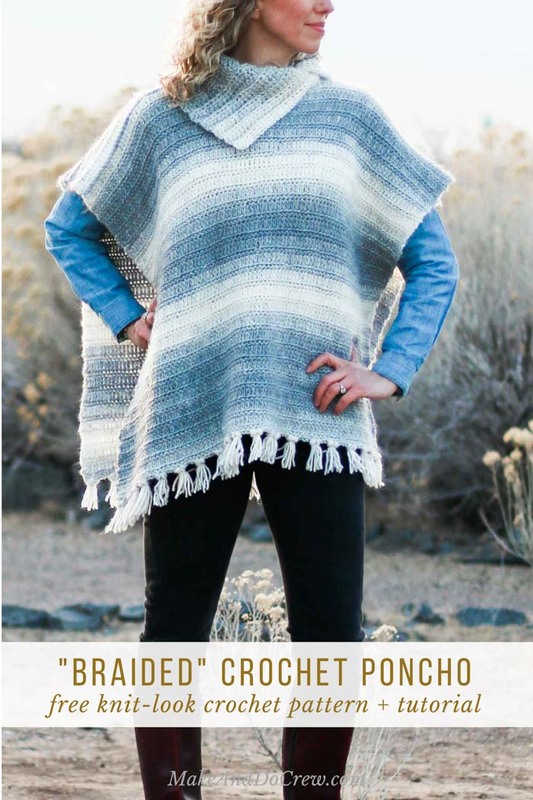 Toss on your new braided poncho for your next moonlit desert hike amongst the cacti! 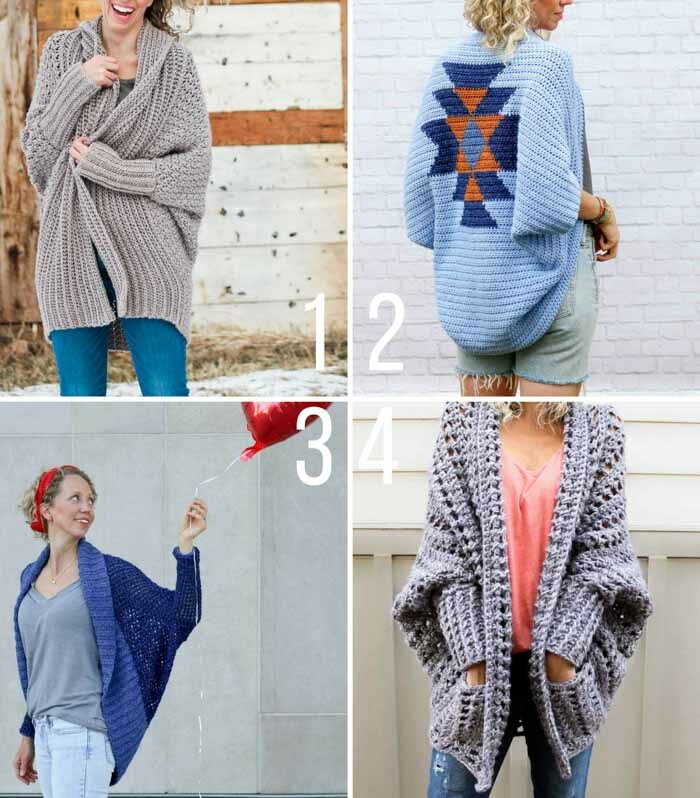 Now that you’ve finished this free women’s crochet poncho pattern, you might like these other free patterns from Make & Do Crew! 4. Sierra Slippers – these mukluk-style crochet slippers make a fast gift idea–for yourself! Great project and so practical. This would be great for outings. 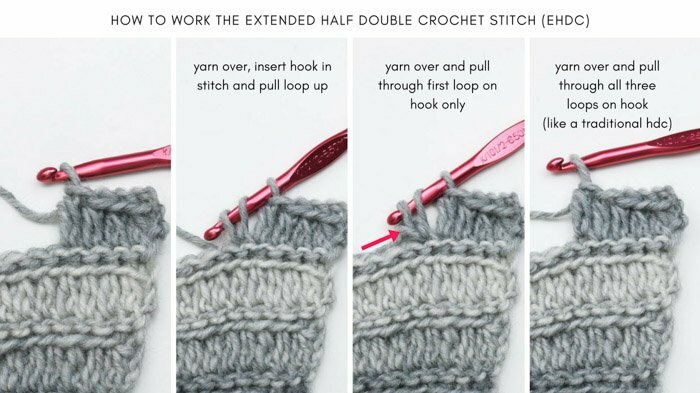 Lovely stitch, I have not seen it before like this, will definitely try it out and use it. I think it will work great on cushion covers and modern blankets as well, looking forward to how you will use it next Thanks! Interesting stitch to learn, yay! I really love how you are so encouraging and always point out that even though we see finished items, doesn’t mean there is no frustration or frogging! Thanks Jess. I am in LOVE with this project! Thank you so much! P.S. Any tips for matching up the new skein? That idea makes me nervous as a new crocheter…. Thank you! I think once you work with this yarn for a full skein, you’ll get a sense of the “rhythm” of the color transitions. I found that most skeins started in the perfect place to just connect to the finished yarn, but in the case you need to adjust it, just wind off the new ball of yarn until you get to the place in the color transition that you’re at with the skein you’re finishing. Hope that makes sense! This is a really great first garment for a beginner! Totally makes sense. Thanks, Jess! I’ve been crocheting for 40 years and have never seen a stich like it. You are amazing! I’m so glad you like it, Shannon! This is the loveliest poncho pattern I have seen! You are quite brilliant! 🙂 Looking forward to creating this. Thanks for sharing your creativity with all of us! Missing Row 5 on the back panel – or is it simply a numbering error? It’s a numbering error. Thanks so much for pointing that out, Jacqueline! On the slip stich rows I am not sure what you mean by the middle loop?